FINALLY! It's fall! And it surprisingly feels like it...every now & then... but I'll take it. This is something I've been looking forward to for some time now. Aside from being a little more than excited for a season change, I've been feeling the need for a change overall. I'm ready for a new haircut, a new tattoo that I've had in my head for who knows how long, a new winter coat, just...something different & exciting. Yeah, I know it all sounds boring and materialistic but I haven't had a pampering day or change up in a long long time. Mostly because money never allowed me to, but my hard work has been paying off & I've been able to save up a little (haven't been able to do that in a long time!). But hey, I'm working on some health & lifestyle changes as well. Like at 10:00 last night while I was frying up some potatoes for my sudden urge for breakfast tacos, I decided to fry them up in...leeeessss butter... so yeah... healthy decision 1. Then I said to myself, "Melissa, how bout just 2 tacos instead of 3?" I started with setting my alarm for 5:30am. I slapped my alarm clock off my bed stand every morning at 5:30am for about 2 weeks. Then I actually started getting out of bed!But it was just to use the bathroom & then back to bed. This went on for about another week. Now, I'm actually staying awake, sitting up in bed & watching Netflix on Maxie the ipad til it's time to get ready for work. Maybe in a week I'll take the big leap and head downstairs and make it to my living room couch. What can I say. I dream big. Okay enough of that. Time to give you what you're really here for. Cupcakes!! 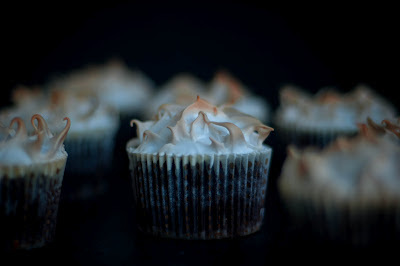 I made these last night & they completely satisfied my chocolate craving. I never thought for a second they would taste anything less then awesome. It's just layers of rich, delicious, radass(trademark billy jewkes)ness. Buttery graham cracker crust, melted bittersweet chocolate, rich chocolate cake, more graham cracker sprinkles, and toasted marshmallow topping. Actually the frosting isn't marshmallow. 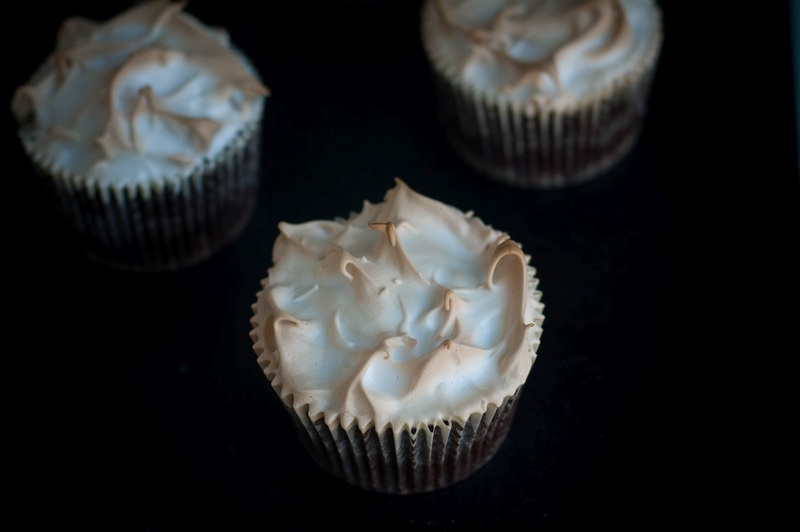 Just a basic meringue. Don't hate me for misleading you... it's still delicious. Promise. Look that cupcake in the face & tell it you don't it!! Preheat oven to 350 degrees. 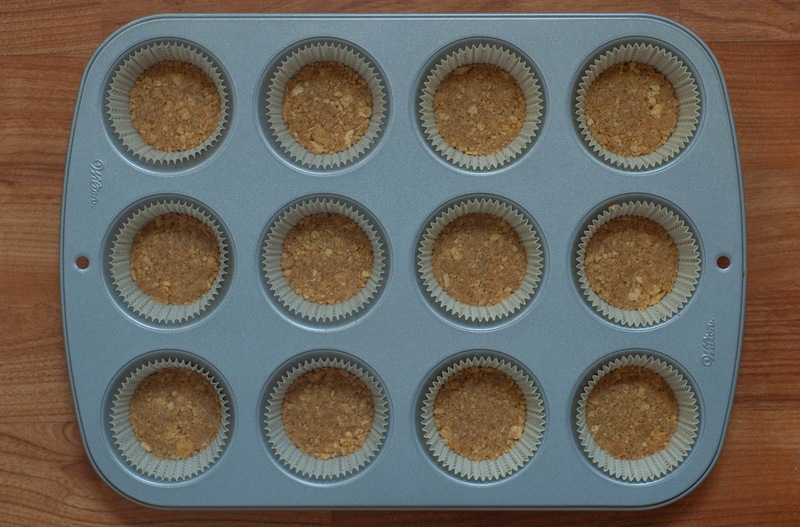 Prepare 2 standard muffin tins with cupcakes liners. Sift the sugar, flour, cocoa powder, baking powder, baking soda, and salt together into the bowl of a electric mixer and beat on medium speed just to combine. In a large bowl mix the eggs, milk, oil, and vanilla. Add to the flour mixture and beat on medium speed. Add hot coffee and stir to combine. Set aside. Stir together the graham cracker crumbs & melted butter. 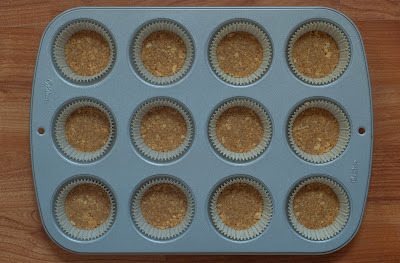 Place 1 tbsp of the graham cracker mixture into the cupcake liners. Press & pack down the crumbs to make a flat crust. Reserve remaining cracker mixture for topping. Place 2 chocolate chips in each crust & bake for about 5 minutes or until the edges of the crust is golden. Remove from the oven and fill cupcake liners about three-quarters full with batter. Bake for about 18-20 minutes or until toothpick inserted in the middle comes out clean ( with some slight crumbs). Transfer to a wire rack for 10 minutes. Remove cupcakes from tin & continue to cool completely. I used the exact recipe from martha Stewart's website for the "marshmallow" forsting. I just cut the ingredients in half since I wasn't planning on using as much. 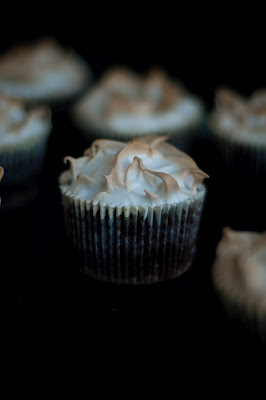 It's just a basic meringue recipe. Use a kitchen torch or a broiler and toast away.